My favorite spot at Lowder is the rocky ridge the trail passes by partway up. This is where some of the uncommon rock-loving plants occur, especially on the small north-facing cliff side. Not surprisingly, most everything is finished here so long after the moisture has disappeared. Seeds were ripe on Castilleja rupicola, Eremogone pumicola, Silene douglasii, and Lomatium hallii, and already gone from the early-blooming Phlox diffusa. But there are two special plants here that are just peaking now: Gentiana calycosa and Campanula rotundifolia. 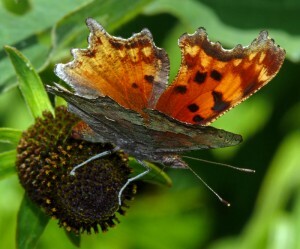 Both inhabit the north side of the ridge and are quite difficult to access for closeups. 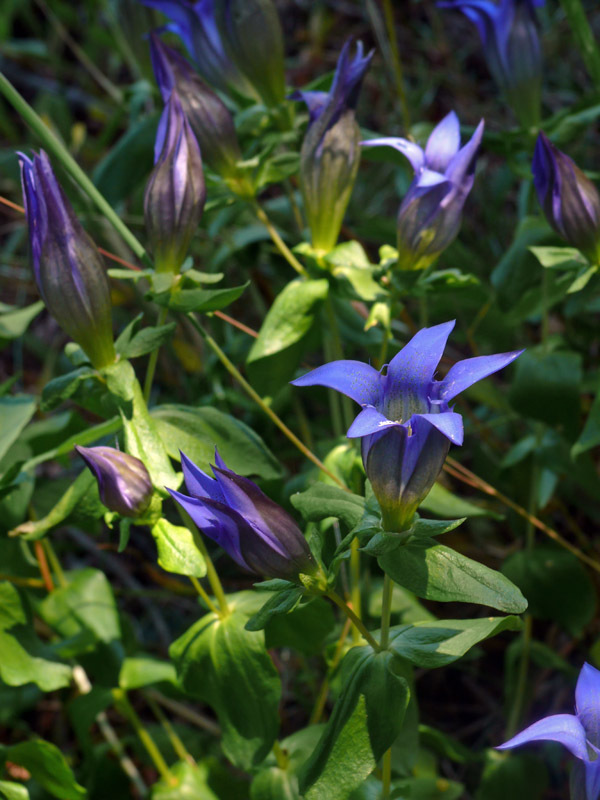 The Campanula especially is way down the cliff. I didn’t see it here for years. Binoculars are a must here and even more so on the upper cliffs below the summit. We continued on up the trail to the meadow at the intersection with the side trail to the summit. While Sabine and Andrew admired the fading but still beautiful skyrocket (Ipomopsis aggregata), I searched the open dirt areas in the meadow. This is where Sabine spotted Gilia capillaris (see New Plant for Lowder Mountain), a belly plant (little annual) normally seen farther south. Most of the annuals were completely dried up except some blooming Polygonum cascadense and some Gayophytum which turned out to be G. heterozygum. It looks very much like the common Gayophytum diffusum except for lumpy capsules that are the result of only some of the seeds forming. What caught my eye, however, was a perfectly dried onion flowering stalk complete with 2 narrow dried leaves. 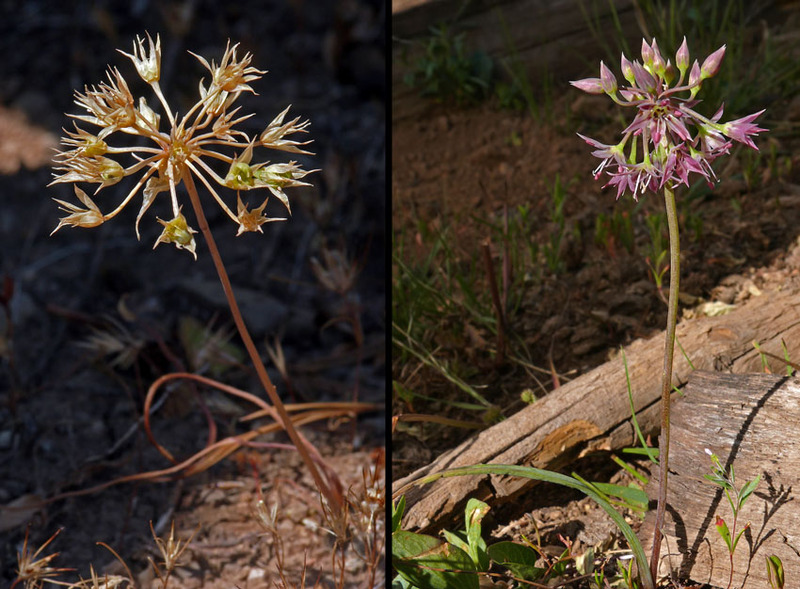 What excited me is that it looks exactly like Allium campanulatum, an onion that rarely crosses the Cascade crest, and I’ve only seen in the Rogue-Umpqua Divide in exactly the same habitat. Without a fully blooming specimen, I will have to wait until next year to be really sure, but it doesn’t fit either of the Allium species likely to be found in the Western Cascades. I searched for a while and only found 4 dried plants. Even in bloom, however, these are scattered about and hard to spot. Both our other Western Cascade onions, Allium crenulatum (much shorter) and A. amplectens (far wetter habitat), usually grow en masse. A fourth species, Allium acuminatum, is apparently found closer to the Valley and east of the mountains, but I’ve never seen it in the Cascades. It differs in having three obscure crests on the ovary. Even dried up, this specimen shows 6 prominent ridges on the ovary, a characteristic of A. campanulatum. The dried Allium on the left from Lowder looks to me like this fresh Allium campanulatum from Donegan Prairie on the right. If they are the same, it would likely be a first for Lane County. Spiranthes stellata has flowers in a single spiral. When we reached the large summit area, there was little in bloom, and we were running out of time to go to Quaking Aspen Swamp, so we turned around before reaching the massive cliffs on the north side. Down at Quaking Aspen Swamp, there was still plenty of moisture and many more things in flower. Oxypolis occidentalis, Aconitum columbianum, and asters, including the little Oreostemma alpigenus, were blooming well. It was the perfect time for starry ladies’ tresses (Spiranthes stellata), which was growing in the boggy areas among the sundews. 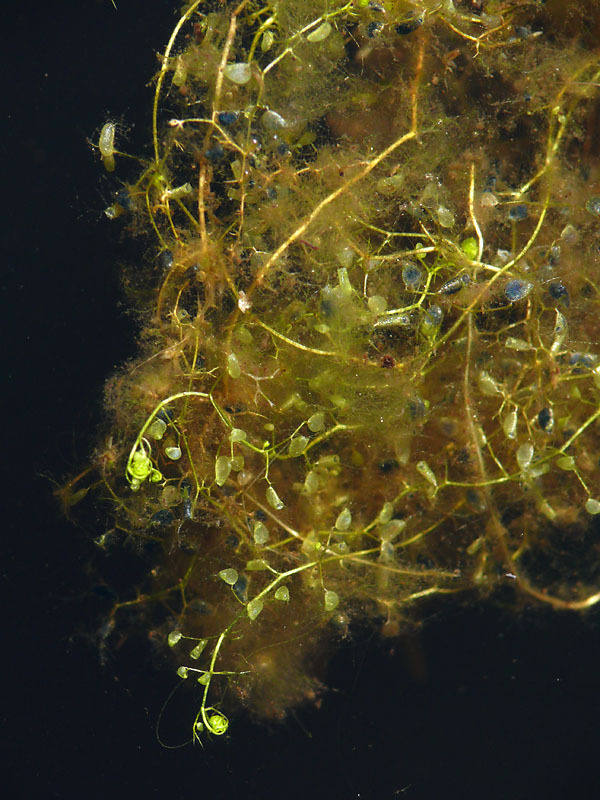 Lesser bladderwort (Utricularia minor) is a carnivorous aquatic plant that catches its prey in small bladders. The dark bladders are full of tiny organisms that make up their diet. I had really wanted to look for the rare bladderwort (Utricularia minor) here, as I’ve yet to see (and photograph) it in bloom. We were able to find it in the deep channel beyond the small lake, but there were no flowers as usual. There were no floating aquatics in lake either. It’s hard to believe it is too early, but maybe the Potamogeton I’ve seen there before haven’t flowered yet. There were certainly pondweed leaves deep in the water. I’m not sure if these are the same as I’ve seen blooming in the past or not. It is hard to study the lake as its shore is not very firm (that’s an understatement), and many pondweeds have two types of leaves. These may have very different upper leaves that aren’t up yet. There were other signs of life in the channel water. We saw a rough-skinned newt trying to look inconspicuous holding onto a sedge, and my first-ever live crayfish. Unfortunately we ran out of time to get to the west edge of the wetland, so we headed into the woods to the small path that runs along near the edge. I took a quick shot of a tiny Hieracium gracile. Normally found in the High Cascades, I didn’t even realize I’d never seen it here before. Sometimes new plants appear even when you are trying not to look anymore!